BOOK 1: What if you canâ€™t trust your own family? Robynâ€™s parents are ruining her life. As if their constant bickering and embarrassing behavior wasnâ€™t bad enough, theyâ€™ve forbidden her from hanging out with her crush just when a flirty new girl moves to their block. Strangely enough, Robynâ€™s parents look the other way when her big brother breaks curfewâ€¦ even after a local girl's violent murder. BOOK 2: â€I wish my parents were immortal bloodsucking vampires,â€ said no one. Ever. Especially not Robyn who is struggling being the only human in a house filled with vampires. Can she keep it a secret that she knows what they are? Meanwhile Jaydenâ€™s family is revealing secrets of their own and nothing is as it seems in Shadow Hills anymore. Who can they trust? BOOK 3: It's a neighborhood like any other. Except it is not. Under the surface lurks so many secrets that the teenagers of Shadow Hills fear for their lives. Jazmine knows her friendsâ€™ parents are strange, supernatural beings, but what about hers? This is the first three books in a fun and frightening series of romantic paranormal mysteries. 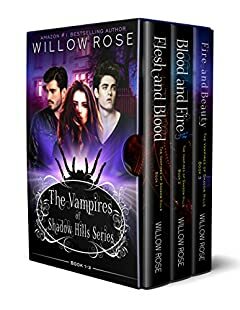 If you like terrifying thrills, flesh and blood characters, and hot vampires, then youâ€™ll love Willow Roseâ€™s spine-chilling tale of this intense love triangle. Buy this boxset to discover a dynamic series with heart-stopping suspense, fierce romances, and jaw-dropping surprises.